In a garden at Niagara Health’s St. Catharines Site, the growing season continues despite the cooler weather. Hope, love, kindness and inspiration are in full bloom, thanks to Recreational Therapists Sarah Kerrigan and Shelby MacDonald who are part of the Mental Health and Addictions team. Last year, Sarah and Shelby launched Niagara Health’s version of the Kindness Rocks Project, an international campaign to spread inspiration and motivation for unsuspecting recipients through random inspirational rocks dropped along the way. The project is part of Niagara Health's Acts of Kindness Workplace Challenge. For the past year, people have been painting rocks featuring motivational messages and leaving them around the grounds of the St. Catharines hospital. But Sarah and Shelby wanted to find a way to make it easier for people to see the rocks, so they created the Kindness Rock Garden. 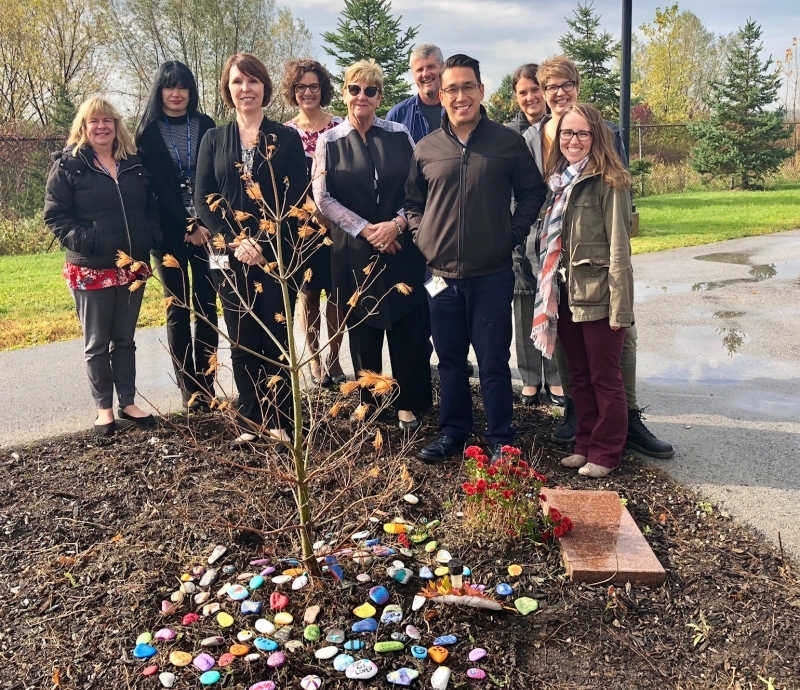 The garden is part of the Katey Marie Campbell Memorial Garden, near the entrance to the Mental Health and Addictions Program. People are encouraged to leave a rock or take one, if needed. "If you’re having a down day or you need some inspiration, it’s always there in the garden," says Shelby. "The rock garden is a great place because the rocks are always there. We want to fill the garden and have it as a place of hope and inspiration." Sarah says it’s been wonderful to see how the Kindness Rocks Project has grown at Niagara Health. Many of the rocks are painted by Mental Health patients and staff. Sarah and Shelby encourage anyone who is interested to leave a rock. "We want everyone to be part of this," says Sarah. "By having the garden, it invites people to be part of it. It's a message of hope."